Five High Schools Selected for Semi-Finals of UTech, Ja. 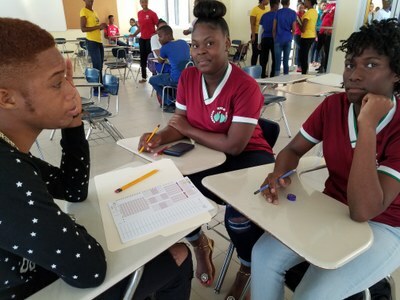 Inaugural Mathematics Quiz Competition — UTech, Ja. 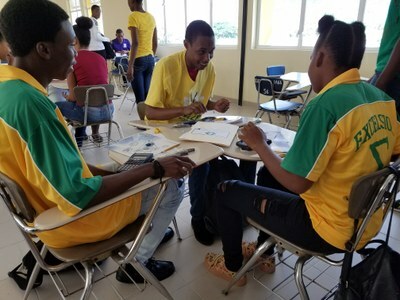 High School Students preparing for the inaugural UTech, Jamaica Mathematics Quiz Competition held on Saturday, November 18, 2017, Shared Facilities Building, Papine campus. 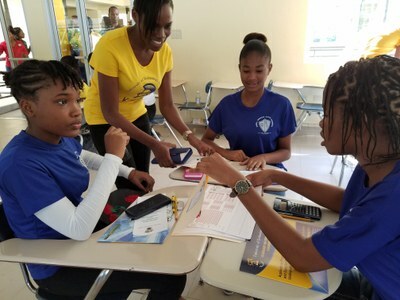 The University of Technology, Jamaica through its School of Mathematics and Statistics (SOMAS), Faculty of Science and Sport on Saturday, November 18, 2017 hosted its inaugural Mathematics Quiz Competition as part of the University’s thrust to promote and develop the awareness of mathematics as a tool for problem solving across disciplines and to generate a cultural change and love for Mathematics in Jamaica and the wider Caribbean. 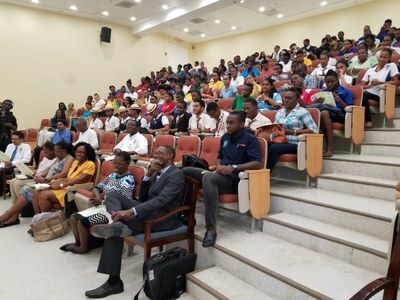 Over 100 eager students from 21 high schools from across Jamaica turned out for the preliminary round of the Mathematics Quiz Competition held at the Shared Facilities Building, UTech, Jamaica Papine campus. The participating schools were Belair High, Campion College, Clarendon College, Excelsior High, Glenmuir High, Herbert Morrison Technical High, Immaculate Conception High, Jamaica College, Kingston College, Knox College, Oberlin High, Merl Grove High, Mt. Alvernia High, Montego Bay High, St. Andrew High School for Girls, St. George’s College, St. Hugh’s High, St. Jago High, Westwood High School, Wolmer’s Boys and Wolmer’s Girls High schools. Emerging in the top five from the preliminary round, were Campion College, Herbert Morrison Technical High, Immaculate Conception High, Glenmuir High and Wolmer’s Girls. The five schools will move on to compete in the semi-finals and finals of the Competition to be held on November 29 and 30 respectively. The winning school will receive a trophy and cash prize of $150,000, second place school will also receive a trophy and cash prize of $100,000 and third and fourth places will receive $50,000 each. Every school will receive a gift basket. Dr. McLean disclosed that the National Standards Curriculum which is being introduced from grades 1 – 9 is designed “to facilitate greater levels of application in learning, with emphasis on project-based and problem-solving activities to facilitate improved learning outcomes.” The Chief Education Officer noted further that the Ministry continues to undertake a number of strategies aimed at improving performance and proficiency in Mathematics to develop competencies to face the challenges of the knowledge-based global society. Among the initiatives she noted, is the establishment of the National Comprehensive Numeracy Programme which has seen increased numbers of mathematics coaches deployed at the primary level. Mr. Patrick Williams, Vice Dean, Faculty of Science and Sport, speaking on behalf of the Dean, Dr. Kamilah Hylton reiterated the value of Mathematics to society. Pointing to the many career opportunities, he noted that UTech, Jamaica trains actuaries – who are vital to our insurance industry, statisticians – who analyse copious amounts of data to guide decision making and influence policy, and also trains mathematics teachers for the education sector. 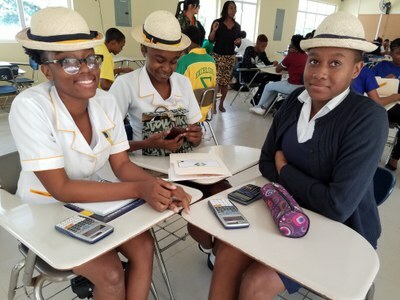 The Vice-Dean noted that the idea of the Mathematics Quiz Competition was proposed by President Vasciannie a few months ago as a way of making Mathematics more appealing for students and to positively influence performance at the CSEC and CAPE levels. He thanked all the persons within the Faculty of Science and Sport for the dedicated work that enabled the realization of the inaugural competition. 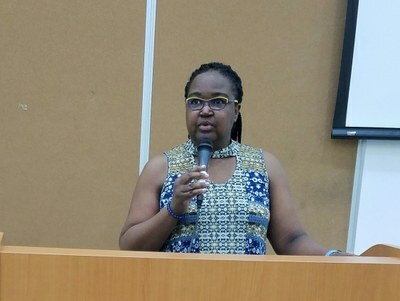 He specially thanked Mrs Ave McIntosh – Head, School of Mathematics and Applied Science (SOMAS), Chair and lecturers who put together the questions for the Competition and serve as judges. 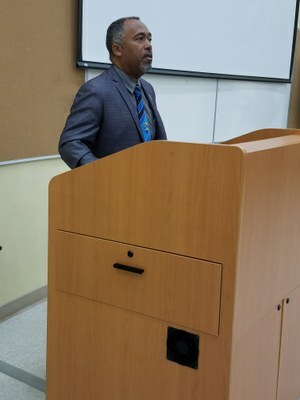 He also thanked FOSS lecturers Dennis Xavier, Vanessa Thomas, Tricia Morris, Stacy Peart, Judith Delisser, Fabian Vassell, Merrick Mullings and David Finlay who created and compiled the assessment. Gratitude was also expressed to Asha-Gay Graham, Anna-Marie Thompson, Simone Ferguson-Treston, Gerlyn Gray Collette Crosdale Mitchell, Kimeisha Jones and Nodley Wright and the SOMAS volunteer students for their valuable input. Mrs Ave Maria McIntosh, in her remarks encouraged the students to become “Mathematics Ambassadors” at their respective schools as they continue to grow their competency in the discipline. The Mathematics Quiz Competition is open to high schools by invitation. The quiz covers all the curriculum of the CSEC and CAPE Mathematics Level 1. Each participating school is allowed to register a maximum of three teams comprising no more than three students on each team. The competition rounds consist of multiple choice and structured questions. Mr. Patrick Williams, Vice Dean, Faculty of Science and Sport addressing the Opening ceremony of the UTech, Ja. Inaugural Mathematics Quiz Competition on Saturday, November 18, 2017 at Lecture Theatre 50, Papine campus.